As we move into an uncertain, potentially dystopian future, Lindsay Tunkl uses performance art to explore death and the end of the world. Lindsay Tunkl is a 31-year-old artist in Oakland preoccupied with life's biggest questions. Lindsay Tunkl grabbed my hands as we sat on a blanket surrounded by death. "In this session, it's really important to know you are in complete control," she said. "If at any time you feel uncomfortable, you can stop." 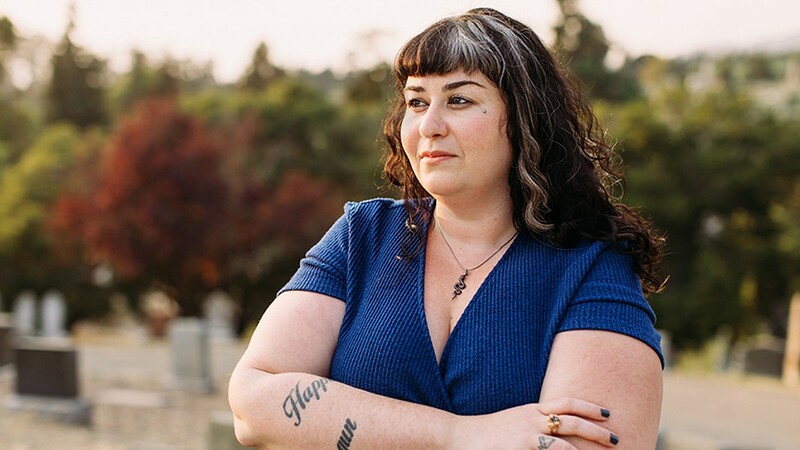 It was a Friday afternoon in the middle of summer, on a grassy knoll under a big oak tree in Oakland's sweeping, lushly green Mountain View Cemetery. I had agreed to participate in one of Tunkl's one-on-one performance art sessions, an exercise in coming to terms with our own mortality. What ensued was an hour of death: death discussed, death visualized, and death meditated upon. She began with a series of questions: What was my first memory of death? Did anyone explain to me what happens when you die? What will happen when I die? Do I identify as someone who is scared to die? Have I thought about how I will die? Her questions quickly revealed how little I had considered the details of my own end. To her, it's a common blind spot of human existence. Why aren't we talking about death more often? "People are dying all the time," she told me a few weeks later. "It's one of the greatest events we'll ever face." Tunkl is a 31-year-old artist in Oakland preoccupied with life's biggest questions, and she investigates them in formats intended to both comfort and challenge you. There are the one-on-one sessions, which can feel as intimate and vulnerable as therapy. There are books, like When You Die You Will Not Be Scared to Die, a recently published collection of musings on all the positive things that might come from death. ("When you die you will stop feeling bad about watching TV.") And there are familiar objects reimagined with whimsy, such as a large prize wheel people spin to land on one of two conclusions: "everything matters" or "nothing matters." That dichotomy is of endless fascination to Tunkl. And it rings especially true today, when people chase personal fulfillment and social media approval in the name of living your best life. At the same time, drastic climate change and political strife signals a society teetering on collapse. Sometimes it feels like a nuclear war could break out at any moment. As we move into an uncertain, potentially dystopian future, Tunkl seems calm, present, and certainly more ready than me. It's taken a whirlwind childhood and years of facing both her past and her fears to get to this point in her life — and in her art. Observing Tunkl observe me on our fatality-themed picnic, I wonder if we all confront the end of ourselves, the entire human species, and the world, we will feel truly free. Experiencing Tunkl's work is a start. In 2012, Tunkl was convinced we were all going to die. Her uncle had been talking about planet Nibiru — according to conspiracy theorists at the time, it was going to collide with Earth in five days. Tunkl started to sob uncontrollably. She was visiting her family and nearly canceled her flight home in a state of panic — this could be the last time they would all be together. "I went into this full-blown other place," she said. "The planet was coming for us very soon." A sinking feeling of terror settled in as Tunkl demanded to know the location of the nearest bunker. She didn't feel ready for everything to disappear and couldn't understand why the rest of her family didn't seem to care. The dismay lasted for hours, and the effects of it, for years. In the end, the planet didn't crash through the ozone layer — it doesn't even exist. But it led to Tunkl's artistic fascination with the end of the world. When she began talking to people about Nibiru, she noticed an immediate fervor and a visible twitchiness. Until this point, Tunkl had primarily been making video art grounded in her personal experiences and emotions — art that people commonly told her was too personal and too emotional. Nibiru was the answer to the future of her art practice. A rendering of the planet nearly hitting Earth still hangs above her desk. "This is where I can talk about my own intense anxiety or fear that's actually linked to so much more," she explained. "It's about loneliness. It's about loss. It's about grief. It's about morals and values. And I can have it be not directly about me. It's big enough to hold a lot, and narrow enough to hit some puncture points for people." Even though Tunkl's work about death and the apocalypse isn't exactly about her, it's very much informed by her past. She's actually had a lifelong fear of asteroids and Nibiru-like situations. She often dreams about things colliding with Earth, possibly a lasting effect of seeing movies like Armageddon and Deep Impact — two doomsday films about asteroids — at a young age. She'd lay awake at night picturing the end of human existence and anxiously wonder which of her separated parents she'd turn to in her final moments. Born in Switzerland, Tunkl spent her early years caught between two parents wrestling with drug addictions and a custody battle, she said. She fondly remembers spending a few years on a farm with her mom and some cats in Northern England. There was a forest right next to their house with some swings and abandoned witches' cauldrons — like real witches, she said — and she went to Catholic school and quickly objected to her teachers' notes on the Book of Genesis. "What about the Big Bang?" she'd ask.